Vertical Personnel Lifts consist of a work platform attached to a vertically extending aluminum mast mounted on a steel base. One worker can stand on the platform with their tools and materials to perform the job at hand. Vertical personnel lifts are small and efficient and help workers increase their productivity by adding to their portability. Bahrns ToyotaLift chooses to specialize in JLG vertical personnel lifts, because JLG's quality line of vertical personnel lifts are known for their dependability, efficiency, and maneuverability. Below is a list of some of the series of vertical personnel lifts offered at Bahrns ToyotaLift of Central & Southern Illinois. The LiftPod vertical personnel lifts are truly the first of their kind, combining the portability and convenience of a ladder with the stability and safety of a work platform. The LiftPod vertical personnel lifts can be raised up to fourteen feet high. Workers stand in an enclosed platform and carry tools and materials on a work tray, allowing workers to move about the platform hands-free. 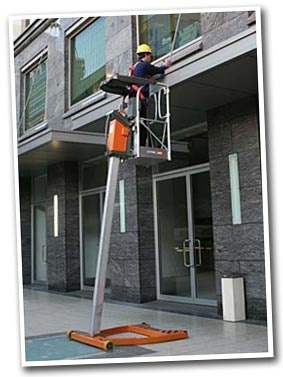 The MVL Series (Verticle Mast Lifts or Driveable Verticle Mast Lifts) of vertical personnel lifts are self-propelled machines that can be driven while the platform is at its peak height. 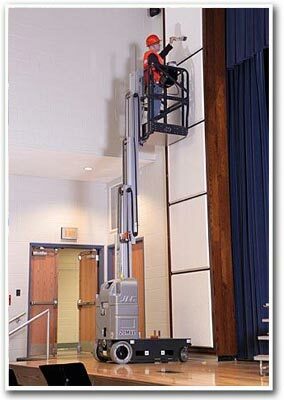 These vertical personnel lifts can lift to 19 feet 6 inches and are incredibly maneuverable. The JLG AM Series of vertical personnel lifts are "push-around" machines that can be rolled in the retracted position through standard door openings. Seven different models of vertical personnel lifts are available in the AM Series with platform heights that range from 15 to 41 feet. 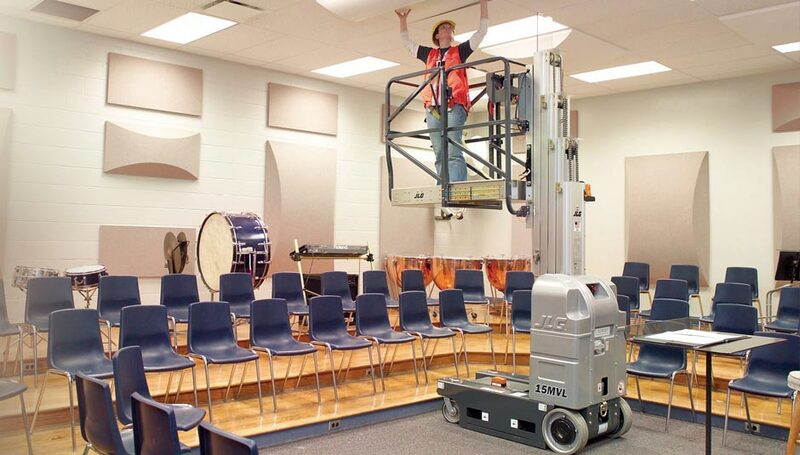 These vertical personnel lifts offer enhanced maneuverability and transport, quick change platforms, and an auto power saver that shuts the vertical personnel lifts off when they are left idle. We invite you to check out our full stock of vertical personnel lifts by coming into our stores and speaking with one of our factory-trained employees. Bahrns ToyotaLift will answer any questions you have about a particular model and assist in choosing the vertical personnel lifts that make the most sense for you and your business.